The menu has a bit of everything, from appetisers like Calamari Fritti ($22) to Wagyu Beef Carpaccio ($25); to main courses like Mushroom Risotto ($35), Home Made Ravioli stuffed with Wagyu Beef ($35) and Black Angus Tenderloin ($49); and desserts like Italian Cheese Cake ($15) and Profiteroles ($15). While the appetisers were tempting, I chose to skip it and go with two main courses. The Taglierini Al Granchio ($30) arrived first – it was decent, but definitely not the best crabmeat linguine that I’ve tasted. After taking a glance at the menu, I immediately knew that I was going for the Black Angus Tenderloin ($49). Served with mashed potato, the Black Angus Tenderloin which came with black truffle sauce was excellent. 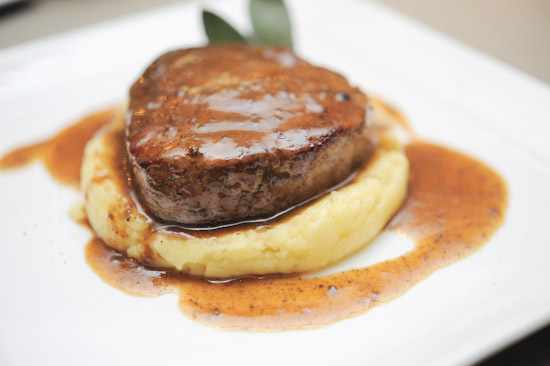 The dish managed to achieve the right balance: the steak was cooked to medium-rare perfection, the mashed potato had the right consistency, and the black truffle sauce complemented the meat nicely. For desserts, I had a hard time trying to decide between the Panna Cotta ($15), Tiramisu ($15) and Molten Chocolate Lava Cake ($18). I went for the Molten Chocolate Lava Cake and I am happy to say it was satisfying. The cake was oozing with chocolate, and it came with a scoop of good vanilla ice cream. While I liked Procacci Italian Restaurant at Customs House, the above-average prices meant that I probably wouldn’t suggest going there any-time soon unless my friends really want to give it a try. But if you have always wanted to eat there, the Italian restaurant is a nice place to go for a special occasion. this iS a horrible review, doesnt say anything AT ALL. Very disappointing for this website. I am a big fan of your blog though! i agree. your description of the food is generic, uninspiring and extremely bland. did you beg the restaurant for free food that’s why you can’t say anything negative? what an amateur attempt. The word ‘latter’ is used when there are two options, not more. The foods really look delicious. Looking forward to visit the place. Keep posting! any italian restaurant serves better food than this…terribly disappointed…untrained staff, horrible food…why did lady iron chef even recommend it? !